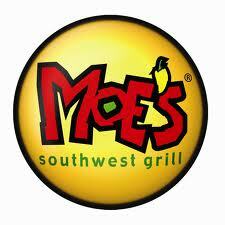 I recently tried a new restaurant called Moe's Southwest Grill. I found it randomly through the internet while doing research. After studying up on it, it seemed to be very similar to Chipotle which is one of my favorite places to eat. There was a Moe's location not to far away, so I decided to give it a try. I went there around 5:00 pm on a week day. I was expecting it to be somewhat busy, but when I got there, the place was empty. There might have been maybe 2 customers in the whole place. Anyway, I knew what I was going to get ahead of time so I went right to the counter. The process was very much like Chipotle. I got a burrito and customized it how I wanted it. I believe it was suppose to come with free chips and salsa. I got the chips, but they didn't give me salsa. Some things didn't happen that I thought would happen. I heard they are suppose to say "welcome to Moe's" when you walk in, but they didn't. I heard they play music from only musicians who have passed away. I don't recall hearing any music while I was there. So how was the food? Overall pretty good. The burrito was similar to Chipotle. The most noticeable difference is the rice. At Chipotle it is bright white, but at Moe's it is more brown like fried rice. They offer a lot of options for things to put in the burritos and tacos which is nice. They also offer different sizes of burritos which is a nice option. Overall I was satisfied with the food. Would I go back? Probably, but it's not something I would go out of my way for. If you like Chipotle, you will probably like Moe's because it is almost the same thing. Basically, when you get tired of Chipotle, but you still like burritos and tacos, go to Moe's Southwest Grill. Upon further visits I learned that there is actually a salsa bar where you can go and pick out the salsas that you want for your chips. Also, sign up for the Moe's email and get a free burrito on your birthday! Sadly the Moe's in the area have closed down. I'm not sure why they did not make it because I thought it was a good restaurant. I do think the menu was a bit confusing with all the strange names for everything. That is the one thing I would change, but other than that, I think it was a hit! Master Chef: How many cooking shows do we need?